So, a much longer evening than we perhaps anticipated. West Ham just about got over the line, Aberdeen also progressed, but no such joy for Inverness CT - or Linfield and Newtown AFC for that matter. We will be back with more football action on Saturday plus the draw for the 2018 World Cup qualifying groups. Between now and then make sure you stay across Sportsday for all the latest transfer news. West Ham's reward for their shootout win? Well, they will play Astra Giurgiu in the next round of Europa League qualifying. I wonder if they'll fare any better in that one? What did we make of that? Worrying? Or something we can put down to pre-season? Either way, I think a huge amount of credit must go to the Maltese side. West Ham did not really look like scoring pretty much throughout the match. Cool as you like from Diego Poyet. That must be the Uruguayan in him. A touch of class! The youngster is as calm as you could possibly be, waiting for the keeper to move before steering in. Dad Gus will be proud. West Ham are through by the skin of their teeth. Fantastic strike. High, into the top corner. Wild! He looked nervous, blowing his cheeks at the end of his run-up, and the defender balloons it! What you want from a left-back. Hard and low, into the corner. Stuart Pearce or Ian Harte would be pleased with that. Steers into the top corner. Textbook. Down the middle, not the best strike but the keeper dived very early and it's safely home. Maltese magic! Pick that one out. Bang, into the top bin. A long wait, but West Ham's go-to penalty man Noble keeps his cool and slots home. Lots of liquid being taken on board, a few rub downs, a few players in animated conversation, others gathering their thoughts. Who thought Europa League qualifying could produce this? Slaven Bilic is clapping his hands, looking around, trying to rouse his players. Matt Jarvis cuts the ball back towards Modibo Maiga but it is cut out. The crowd are trying to raise their tiring team, see them through to a shootout. Just a couple of minutes left. Martin Samuelson replaces Matt Jarvis. Modibo Maiga has the ball in the net, slots home, but the flag goes straight up for offside. Very tight but probably the right decision. Five minutes left, West Ham knocking the ball around the middle of the park. Slaven Bilic does not look thrilled on the touchline. West Ham win a series of free-kicks but just cannot make the breakthrough. Eight minutes from a penalty shootout. So, we are 10 v 10 but it is the home team who attack next, striking on the break and Edmond Agius is well placed and forces a save from Adrian. The Hammers are enjoying most of the possession now and win a free-kick about 10 yards outside the Birkirkara area for a foul on Mauro Zarate. The foul is by Edmond Agius and I'm not sure whether the impressive Mauricio Mazzetti said something but he was soon shown a second yellow. Hmm, I must confess I'm slightly confused. I had a look at Malta club coefficients rankings on the Uefa website and saw that they were 45th. But another page I've just seen on the Uefa website suggests they are 51st. No matter, they are doing very well against the Hammers - we are 15 minutes from penalties. Very little to report from the first half of extra-time. Birkirkara finished third in their domestic league last season. The tempo of the game is now incredibly slow from both teams. Can West Ham finally make their supposed extra class show? Matt Jarvis still has plenty of running in him and the Hammers are starting to exert a little more influence. Hammers fans spare a thought for supporters of Skonto FC from Latvia. They've been tonked 9-2 at Debrecen this evening. West Ham win a corner - what can they do? The ball breaks to the increasingly influential Matt Jarvis, whose strike is deflected wide. From another corner Birkirkara break but Vito Plut's weak shot is poor and easily saved. Birkirkara's keeper Justin Haber has a white kit on and there is hardly a mark on it. The Hammers, in their away kit, have lacked speed in possession, their passing has been poor. The Maltese side have rarely been threatened this evening. It has been poor. Farewell to Linfield as far as the Europa League is concerned after they were defeated 3-1 by Spartak Trnava. That tie ended 5-2 on aggregate. And so we have extra-time. Yes, you have read that correctly. The Hammers have now played more than half the game with 10 men. Into injury-time. This has been poor. Modibo Maiga seems incapable of holding the ball up. Anonymous: "Wifi not very good in Protaras , Cyprus . Just got connected . Superb stuff. From the Dons . COYR's"
Michael, Shetland says he's about to book the next Pittodrie European game on 6th August after an absence of 25 years since leaving university! Well done the Dons!!! Aberdeen safely through in the end after a couple of wabbles in the second half when Rijeka temporarily ate into the Dons'aggregate lead. Derek McInnes's side will face Kairat Almaty in the next round. West Ham have a free-kick well within range. Aaron Cresswell takes it but it comes to nothing. Well into stoppage time at Pittodrie now. James Tomkins won't be scoring in injury-time this week. But will any Hammers? About 5 minutes left. Argentine central defender Mauricio Mazzetti is not afraid of pushing forward. He passes to Ryan Camenzuli, who then forces a save with a long-range strike that Adrian comfortably saves. We've got about eight minutes of normal time remaining and no sign of a decisive goal from either team. I'm sure that West Ham, a man down and lacking match sharpness, are just desperate for another 30 minutes. Niall McGinn, the scorer of Aberdeen's first goal this evening, is replaced by Willo Flood. And off he goes...former Italy striker Fabrizio Miccoli is replaced by Vito Plut. Miccoli is 36 now and does not look in the greatest of shape. Mind you, he has scored the game's only goal. Scotts & Nicholsons: "Back in the game. Yass!! Keeping up with the Dandies via BBC in the Algarve again with awful wifi!! COYR!!!" I know it is hot and still pre-season and the Hammers have had a man sent off but really, should West Ham be making such very, very hard work of this tie? Peter Pawlett and Adam Rooney come on for Kenny McLean and David Goodwillie, with the latter getting a standing ovation from the crowd after setting up both of Aberdeen's goals tonight. And yes, for those wondering, Diego Poyet is indeed the son of Gus. There are 20 minutes of normal time left. Finally some threat from West Ham, finally getting in behind Birkirkara and wanting a penalty after Mauricio Mazzetti appears to catch Matt Jarvis late after the Hammers man puts in a cross. Good appeal but it falls on deaf ears. We could be looking at extra time. I fancy that Fabrizio Miccoli will struggle to last through that. And that should be that as Jonny Hayes fires Aberdeen level on the night, with David Goodwillie again providing the assist. The Dons now lead 5-2 on aggregate. Andrew Priestley: "Massive goal from Niall McGinn and Aberdeen! He has been the club's standout performer over the past couple of seasons. #bbcscotfootball"
Rowen Muscat goes down. Not sure why, there was nobody near him as he did so. Seems to be holding his hip, but is back on his feet. The Maltese team are not in any obvious rush - and why would they be. That Niall McGinn goal means there cannot be extra-time at Pittodrie. A sign in the Copenhagen end after they beat Newtown 3-1 tonight. I wonder if West Ham would rather be in Wales right now? Substitution for West Ham - and a double one as Diego Poyet comes on for skipper Kevin Nolan and Modibo Maiga replaces Morgan Amalfitano. Interesting move. Eric: "#bbcscotfootball in truth Inverness were poor in both legs"
But wait, Niall McGinn responds immediately for the Dons, converting David Goodwillie's low cross with a fine finish. The Dons now lead 4-2 on aggregate. It just got a bit more nervous for the Dons as Zoran Kvrzic's shot takes a deflection and finds the net. What a miss! David Goodwillie is released down the right and centres for Jonny Hayes, who elects to stoop and head the ball and contrives to miss the target. "It makes it a little bit more nervous but Aberdeen are still in control. It's up to the players to handle the situation." Marin Tomasov reduces Rijeka's aggregate deficit, drifting into space in the inside right channel and steering the ball into the net after resisting a couple of challenges. West Ham messing about in a dangerous area and looking less than composed, conceding a throw-in. James Collins eases Fabrizio Miccoli away from the ball, using his superior strength as the Italian takes a tumble and looks at the referee. Nothing doing. Fabrizio Miccoli whips in a dangerous corner that Adrian just manages to punch clear. The home side are visibly growing in confidence. I'm trying to think of West Ham's best moment so far. I'm not sure there has been one. It's all over in Romania and Inverness Caledonian Thistle's first foray into European competition comes to an end. A decent performance over the two legs from John Hughes' side but ultimately Astra Giurgiu captain Constantin Budescu's free-kick goal in Inverness last week proved to be the difference. Newtown were defeated 3-1 by FC Copenhagen - the Welsh side defeated 5-1 on aggregate. Linfield remain 1-0 up against Spartak Trnava, that is 2-2 on aggregate so looking good right now for the Northern Irish side. Doug Singer: "#bbcscotfootball Hammers lacking any real fluency and even less discipline. Not really shocking. 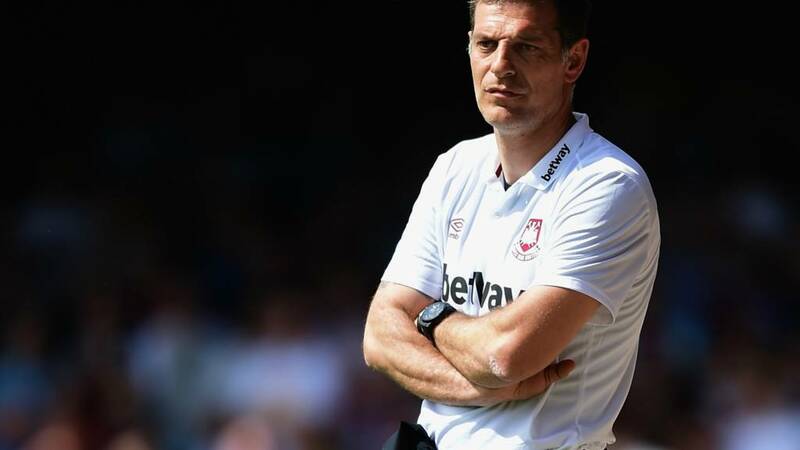 But Slaven Bilić has much work ahead." Play resumes in Malta. Ten man West Ham have it all to do. Ash Taylor gets on the end of Jonny Hayes delivery but cannot quite direct it on target. Early second-half applause from the home crowd. Into stoppage time now in Romania. Can Inverness get the goal to force extra-time? James Grech: Won't be easy for West Ham: feels over 30ºC & almost 80% humidity. Hot, wet & uncomfortable: from a local sitting under the AC! Owain Fon Williams denies Constantin Budescu as the Astra captain tries to finish the tie but it's still goalless on the night. Stavros Makrozachopo: "It's July,it's Europa League,it's 2 weeks before the start of the PLeague but this will not go down well with the WestHam fans #bbcfootball"
Ross: "I think Aberdeen need to stay defensive more than offensive so they don't concede"
Colin Webster: "Trying to follow the @ictfc game on holiday in Portugal..with terrible wifi connection! #bbcscotfootball"
Paulinator Maximus: "#bbcfootball west ham have to move the ball more quickly. This is easy for Birkirkara to defend." Marcelina has a shot saved on the stroke of half-time. West Ham a goal down and a man down. And you have to say, looking pretty rattled. The tie is level on aggregate. Slaven Bilic has got a big 15 minutes coming up here or the Hammers could be out of Europe before they've really got going. And that Niall McGinn shot brings the first half to a close with the Dons still three up on aggregate and still very much on course for the next round. Niall McGinn's shot takes a deflection en route to goal and goalkeeper Simon Sluga does well to turn the ball away. Some serious handbags here. Lots of pushing and shoving in the Birkirkara area after Nikola Vukanac goes down following a tangle with James Tomkins. Both looked guilty of going for each other in what has been a bad-tempered game. Vukanac is incensed and after a lengthy delay the West Ham man is shown a red card. A big surprise, not a red for me. Vukanac is just booked. No wonder plenty of away fans are in full-on teapot mode. Adam in Edinburgh: "Such a shame Caley don't have a suitable striker anymore, we lose a good one a every couple of seasons and clearly haven't replaced well this time unfortunately." "Inverness still very much in this match. Still struggling to create chances. The game's becoming a bit more stretched and if they get the chance, they'll have to take it." West Ham look like a team some way short of match sharpness. That said, they finally string a series of passes together and work their way upfield, eventually winning a corner. Like so much for the Hammers this half though, it comes to nothing. Jonny Motion: "#bbcfootball the ref at the aberdeen game is obviously just here for the free holiday, cause he hasn't made one good decision so far"
Sean Fitzgerald: "#bbcscotfootball typical West Ham, a game they should really be winning they are behind, same old players, same old outcome"
Stephen Lowry has scored for Linfield, that puts them 1-0 up on the night against Spartak Trnava and the tie finely balanced, 2-2 on aggregate. FC Copenhagen 3-1 up at Newtown. A bit of panic for Rijeka as Jonny Hayes flashes the ball across the area and both goalkeeper Simon Sluga and Aberdeen's Kenny McLean completely miss the ball. Birkirkara goalscorer Fabrizio Miccoli, once dubbed the new Del Piero, certainly likes an argument. He and Mark Noble have been at it for ages. He is 36 now, small and stocky, but has 10 caps for Italy and sprung to life when the chance came his way. Eamonn: "I wonder if we can get Miccoli on loan for the season." Paulinator Maximus: west ham have been underwhelming in the preseason so far. Lots of room for improvement. You wouldn't say that West Ham have really turned it on since falling behind. Kevin Nolan loses the ball in midfield and Birkirkara push forward again with new signing Marcelina involved. It has been scrappy and far from impressive by the Premier League side. jeremy wood: "#bbcscotfootball following the Dons in California. Kazakhstan here we come #COYR"
Kazakh side Kairat Almaty await the winner of Aberdeen's tie in the next round. So far in the second half in Romania, Dani Lopez has missed the target with an effort for Inverness and Astra's Constantin Budescu, scorer of last week's winner, has forced a save from Owain Fon Williams. Not content to just sit on their 3-0 aggregate lead, Aberdeen are probing at Pittodrie but to no avail so far. Linfield in action tonight, the Northern Irish side hosting Spartak Trnava. That match kicked off at 19:45 BST and is currently goalless, with the away team holding a 2-1 aggregate lead. FC Copenhagen are now 3-1 up at Welsh side Newtown. Andrew Priestley: "West Ham making life very difficult for themselves I see. Some things never change! #bbcfootball"
Rocky: "I can see West Ham getting beat tonight we didn't do a good enough job at Upton Park"
Also in action tonight are Linfield, trailing 2-1 on aggregate against Spartak Trnava with the second leg still goalless. Matthew Turner: "#bbcscotfootball Really hoping Inverness win tonight. They deserve a good run in Europe." We've not seen much of lone striker Mauro Zarate so far. The Hammers just have not got into the game. The second half has started in Romania with Inverness still seeking to level the tie. Wow. A goal for the Maltese side - and you cannot say they do not deserve it. Edmond Agius delivers a low ball into a dangerous area in the penalty area and Fabrizio Miccoli shows he has lost none of his poacher's instincts, sliding in ahead of Joey O'Brien to stab home. A rehearsed corner kick from Aberdeen. Jonny Hayes sits deep to collect a pass and bends a shot over the crossbar. Corner to West Ham - their first of the match. Mark Noble delivers and the ball is only half clear, falling to Matt Jarvis just inside the edge of the box. His low strike is well saved by Justin Haber diving low to his left. The Dons supporters take exception to some heavy tackling from Rijkea after Jonny Hayes is fouled. I think the diplomatic way to put it is to say it was a "robust" challenge. Poor from James Collins, who fails to deal with a cross from the right. Fabrizio Miccoli whips in a corner and Collins heads clear. Ryan Camenzuli then shoots way over from long distance. Wonder what Slaven Bilic makes of this performance so far? The Hammers looking to try to take the sting out of their opponents, keep possession, slow the pace down. A decent start from Birkirkara, who are very much on the front foot. Joey O'Brien makes an excellent block to snuff out a shot from former Italy international Fabrizio Miccoli. It's half-time in Romania with Astra Giurgiu still ahead 1-0 on aggregate. And the Dons are underway against Croatia's Rijeka. The ref looks very young. Been plucked off the beach? We have kick-off in Malta. Sean: "Hoping the Caley lads can pull it off tonight, really fancy a potential trip to London next week and keep the Europa dream alive. Either way what an achievement of our club, would be great to have 3 Scottish teams remaining in Europe!" Goalkeeper Silviu Lung Jr denies Aaron Doran after the Inverness winger fires in a shot. Just the six subs for West Ham tonight. Apparently they will play a 4-2-3-1 formation. The teams are making their way out - the Hammers led out by Kevin Nolan and wearing their away kit. Inverness defender David Raven, playing at left-back this evening, has been cautioned for a foul on Pedro Queiros. It's a much-changed Rijeka facing Aberdeen this evening at Pittodrie. Former Croatia Under-21 keeper Simon Sluga's inclusion is one of the five changes while Croatia winger Anas Sharbini and Albania striker Bekim Balaj are among those dropping out. "The same pattern throughout this first half, Inverness comfortable on the ball but, once they get to that final third, struggling to impose themselves. "Neither side has really had a direct shot on target. Inverness are still very much in the tie." David Raven is off target with an effort for Inverness. Still no scoring on the night in Romania with Astra holding that one-goal aggregate advantage. "It's an intriguing one. Inverness very comfortable on the ball but not creating much. Some really nice passing. I'm not sure if Astra are just sitting off them and allowing them to do that. "Inverness haven't conceded and that's something John Hughes put a lot of emphasis on before kick-off." So, just that one change for Aberdeen but manager Derek McInnes says Peter Pawlett, who makes way for Kenny McLean, will still have "a big part to play, probably in the second half". Aberdeen: Ward, Taylor, Quinn, Considine, Logan, Hayes, Jack, McGinn, Shinnie, McLean, Goodwillie. Subs: Brown, Flood, Rooney, Smith, Robson, Pawlett, Rose. Rijeka: Sluga, Bradaric, Samardzic, Mitrovic, Leovac, Tomasov, Radosevic, Ristovski, Roshi, Moises, Bezjak. Subs: Vargic, Kvrzic, Balaj, Tomecak, Mocinic, Bertosa, Jugovic. There is another Europa League match that we should tell you about, with Welsh side Newtown AFC hosting FC Copenhagen. listen to commentary of that match. "It's really important to realise we got a fantastic result last week because of our approach to the game. "The game isn't going to be any easier tonight because of the result last week. It's a tough game for us. The same discipline is required. "We've got a job to do tonight." "It's going reasonably well for Inverness. Very comfortable so far. No real chances thus far." Birkirkara: Haber, Zach Muscat, Vucanac, Mazzetti Latini, Joe Zerafa, Rowen Muscat, Emerson, Camenzuli, Liliu, Fenech, Miccoli. Subs: Atkpan, Sciberras, Agius, Plut, Daniel Zerafa, Murga, Zammit. West Ham: Adrian, O'Brien, Collins, Tomkins, Cresswell, Amalfitano, Kouyate, Noble, Jarvis, Nolan, Zarate. Subs: Randolph, Maiga, Poyet, Hendrie, Samuelsen, Pike. West Ham make two changes from the first leg, as James Collins and Cheikhou Kouyate come in to replace Winston Reid and Modibo Maiga. Maltese side Birkirkara make just one change as Marcelina Emerson replaces Edin Murga. Former Italy international Fabrizio Miccoli leads the line again. This just in, there will be one change to the Aberdeen starting line-up this evening with Kenny McLean, scorer of the third goal last week, coming in for Peter Pawlett. Aaron Doran has had an early shot blocked for the visitors but no goals so far. The second leg of Inverness Caledonian Thistle's tie is underway in Romania. West Ham, who have a slender 1-0 after their first leg, are not in action until 19:45 and the Hammers probably glad it is an evening kick-off in Malta. "It will be a challenge with the heat," said Mark Noble. "But we're looking forward to it. "Last Thursday was only our second game we've played in pre-season, so we're still unfit really and it was good to get the win. "They were enthusiastic, they ran about a lot, but we got the win which was the most important thing and now we've got to go out there and try to finish the job." Can John Hughes mastermind a comeback for Inverness in their tie against Astra Giurgiu?Image caption: Can John Hughes mastermind a comeback for Inverness in their tie against Astra Giurgiu? BBC Radio Scotland pitchside reporter at Pittodrie Chick Young says Aberdeen will field the same team that won so convincingly last week. Listeners in Scotland can follow live commentary of Aberdeen v Rijeka with updates from Astra v Inverness on BBC Radio Scotland 810MW. That coverage is also available on DAB digital radio and here, via the BBC Sport website. Click the play button or select the 'Live Coverage' tab. The prizes on offer tonight? Well, Kazakh side Kairat Almaty will face the winner of Aberdeen's tie after beting Armenia's Alashkert 4-2 on aggregate. And West Ham would face Inverness if both proceed to the next round. Club captain Richie Foran is on the bench again for Inverness after making his return from injury as a substitute last week in the first leg. Dani Lopez continues in attack, supported by Ryan Christie and Aaron Doran. Constantin Budescu, scorer of last week's winner for Astra, features for the Romanians again. Astra Giurgiu: Lung Jr, Geraldo Alves, Junior Morais, Gaman, Pedro Queiros, Seto, Enache, Boldrin, Teixeira, William Amorim, Budescu. Subs: Gavrilas, Florea, Oros, Lovin, Dandea, Alves, Stan. Inverness CT: Fon Williams, Raven, Warren, Meekings, Devine, Wedderburn, Doran, Tansey, Williams, Lopez, Christie. Subs: Esson, Draper, Foran, Horner, Polworth, Jason Brown. You can also tweet using the hashtags #bbcfscotootball and #bbcfootball. Let me know your thoughts on this evening's games by texting 80295. Later Aberdeen and West Ham aim to protect leads in their respective ties against Croatia's HNK Rijeka and Malta's Birkirkara. The Dons netted three away goals without conceding last Thursday while the Hammers hold a slender 1-0 advantage ahead of their away leg. The Scottish Premiership side trail 1-0 following last week's first leg in Inverness, meaning the Highlanders have to score in Romania this evening to keep the tie alive. It's the second leg of the second qualifying round and first up is Astra Giurgiu v Inverness Caledonian Thistle at 19:00. Good evening and welcome to this evening's live Europa League coverage.